Bidder misses payment deadline, leaving proposed sale of 1969 Charger owned by actor John Schneider in doubt. Car may go back on the auction block. NEW YORK (CNNMoney.com) -- After commanding a winning bid last week of nearly $10 million, the online auction of a 1969 Charger, owned by one of the stars of the "Dukes of Hazzard" television show, has blown a gasket. The winning bidder, William Fisher, maintained that someone else placed the bids in his name after gaining access to his eBay account. "Of course I have no plans to pay, because I didn't place the bid," an individual claiming to be Fisher wrote Thursday in an e-mail to CNNMoney.com. "I just want this to all blow over, which I'm sure it will." 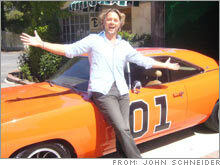 John Schneider, who played Bo Duke in the series and owns the car - called the General Lee on the show - told CNNMoney.com he had been in contact with Fisher and was aware of his claims. An EBay spokeswoman said there was no evidence that Fisher's account had been hacked. During the course of the auction last week, eBay officials disqualified several bids and went so far as to contact several of the top bidders to verify their offers, an eBay spokeswoman had said earlier. A winning bid on eBay constitutes a legally binding contract, according to a company spokesperson, although company policy allows Schneider to approach the second-highest bidder about purchasing the vehicle. Schneider told CNNMoney.com Thursday afternoon he is considering putting his car back up for sale on eBay, but said this time bidders would be carefully pre-screened by an outside firm before the bidding started. The vehicle is a modified Charger that appeared as the General Lee in the TV show. The car has been further modified since and now has a 725 horsepower Hemi motor, Dodge Viper brakes and a roll cage, all of which allow it to race at more than 200 miles per hour. Recently, the vehicle had a central role in a limited-release film produced by, directed by, distributed by and starring Schneider. The actor decided to auction the car in order to finance a production of a sequel to that film. "Guess I'll have to have a bake sale to fund the movie now!" Schneider said in an e-mail after initially learning that the auction was in jeopardy. During filming, the show typically went through several cars per episode during its 6-year production run in the early 1980s. Ordinarily, a production-used General Lee would be worth about $150,000 to $200,000, said McKeel Hagerty, president of Hagerty Insurance, a collector car insurance company. About 20 of those are known to exist in reasonably good condition. The opportunity to buy the car from "Bo Duke" himself would add some value, he said. But not millions of dollars.